John Lennon was a singer/songwriter from Liverpool England. He was one of the founding members of the pop/rock band, The Beatles, along with Paul McCartney, Ringo Starr, and George Harrison. This group quickly became one of the most popular of all time in the mid to late 1960s. This led to many people seeking to imitate them in appearance. 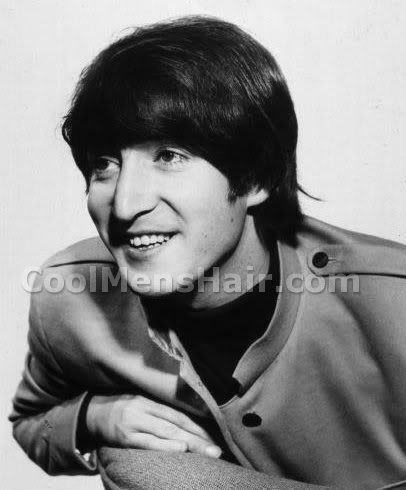 John Lennon mop top hairstyle. This hairstyle was so named because it looked very much like the head of a string mop. The back and sides were cut to a medium length and the fringe (bangs) was cut evenly across the forehead just above the eyebrows. It was inspired by the appearance of Jurgen Vollmer, as seen by John and Paul while hitchhiking to Paris one day in 1961. Shortly after they arrived in the US, The Beatles were in a press conference when a reporter asked George Harrison what he called his hairstyle. His response was, “Arthur”. Following that event, many Beatles fans began to refer to this hairstyle as the Arthur. 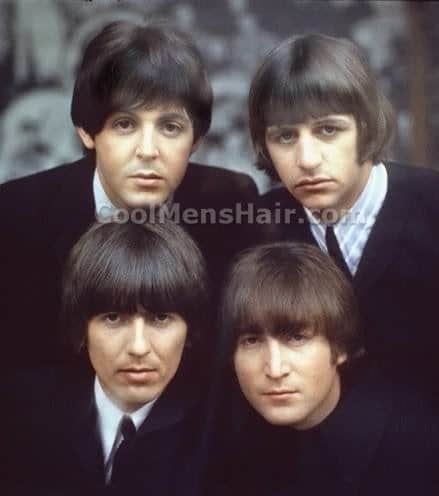 The style was so popular around the world from 1964 to 1966 that many toy makers began to produce and market “Beatle Wigs” made from both plastic and real hair. One manufacturer, the Lowell Toy Manufacturing Corporation, was actually licensed to produce “authentic” Beatle Wigs. These have become a highly collectible item in recent years if still in their original packaging. Even young men in Communist countries such as The Soviet Union began to adopt this hairstyle. It was seen by the government as a sign of extreme rebellion. Men wearing it would be arrested, taken to a police station, and forced to have their hair cut before being released. Adults and government officials referred to these individuals by the nickname, “Hairies”. 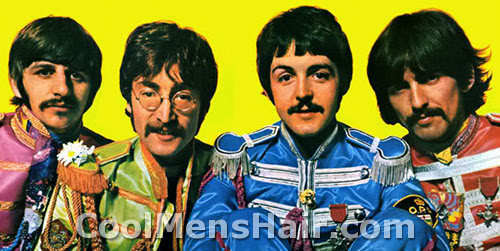 The Beatles haircut with mustaches. For John Lennon & The Beatles mop top haircut, 1964 to 66 were a good period. After that time, the group began to experiment with different looks, including all four wearing mustaches when they posed for the cover of their Sgt. Pepper’s Lonely Hearts Club Band album. They also began to let their hair grow much longer and John began to wear the glasses for which he is so well known. Lennon retired from recording in 1975. In 1980, he did record and release one more album. Shortly after its release, he was murdered. John will likely be most remembered for his anti-war songs during the Vietnam war that had the Nixon administration looking for a way to have him deported. The Beatles were awesome, but bangs look awful on guys. Especially mop top bangs. Just saying. Depends on oyur face shape and all that. Me i’m not arguing just saying. I mean ive had the mop and it suits me. But now ive got a newer better style jsut longer and with soem bangs. that pic of john at the start isnt john lennon btw. Who do you think it is? Hint: check out the front teeth.